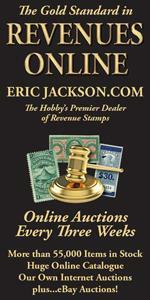 Expertizing is the science of ascertaining whether a stamp is genuine or not genuine. Condition is not a factor of expertizing. Condition is merely a matter of value. A genuine stamp with a tear, a thin spot, a hole, a crease or a stain is still a genuine stamp. Besides, quality perceptions are usually imprecise, largely subjective and change over the years. Having thus defined the term “expertizing”, to do so some fundamental knowledge is needed. It is necessary to know papers, colors, designs, printing processes, printing inks, overprints, separation methods, gums, watermarks, cancellations, hand stamp overprints, repairs and alterations. PAPERS. Nearly all stamps are a paper product. There are a few exceptions. For example the 1852 India ½a red Scinde Dawk is not paper but a wax wafer, and some modern stamps are made using silk, gold and aluminum foil, even plastic. According to tradition, paper was invented around the year 100 AD in China by Ts’ai Lun. The use of paper was introduced into Europe by the Moors around the year 1100, and in the succeeding centuries the craft of paper-making spread around the world and replaced the use of papyrus, vellum, parchment and sheepskin as a writing surface. Paper is made by the webbing of vegetable cellulose fibers. The raw materials are wood, cotton, rice, bark, rags, straw and other fibrous material. Modern papers since 1955 may also contain nylon, dacron and orlon fibers. For high quality paper (and most stamps are printed on high quality paper) rag fibers alone are used. The process of paper-making, simply stated, involves the breaking up of the raw material by pounding it to separate the fibers, cooking it in water to form a suspension of individual fibers, and the spreading of this suspension on a mold, which has a porous surface through which the excess water is drained. This porous surface is usually a reinforced sheet of metal mesh having either a square mesh pattern, called a wove pattern, or long wires held together with small transverse wires, called a laid pattern. Depending on the style of the mold, paper is identified as wove or laid. After the wet paper is sufficiently cohesive it is placed on a sheet of woven woolen cloth, called a felt. Another felt is laid over the sheet of paper and the process is repeated, and finally the stack of interleaved sheets is put in a hydraulic press and subjected to a pressure of 100 tons or more, squeezing out the remaining water. Depending on the fineness or coarseness of the screen and the felt, the finished papers can vary from thin and hard with no visible mesh to soft and thick with a pronounced mesh. Machine paper-making is considerably more complex, but the essential procedures are identical. To make the paper suitable for writing or printing, additional treatments are required, and these additional treatments are of importance in expertizing. In blenders the paper pulp is mixed with fillers and sizing, sometimes also with dyestuffs and minute pieces of silk or cloth threads, or even tiny pieces of colored paper. The filler gives body to the paper. The most commonly used filler is a mineral, hydrous aluminum silicate, called kaolin, also sometimes called China clay. The usual percentage of filler is from 2% to 4%. Experiments have been made with much higher contents, as high as 15% to 20%. A good example of these are the 1908 Washington-Franklin head “Clay Papers”. Modern fillers may also contain titanium oxide or calcium carbonate. The sizing decreases the paper’s porosity, depending on the amount of sizing. It also adds to the strength of the paper. Normally an animal glue with an addition of potassium aluminum sulfate, the so-called paper-maker’s alum, is used for this. The alum has the additional benefit of protecting the paper from bacterial deterioration. The dyestuffs are used to color the paper. Sometimes a fluorescent substance is added to make the paper appear a bright white. The additions of tiny silk or cloth threads produce the silk or granite papers. Finally, to give the paper a smooth surface, it is subjected to a process called calendering. The paper is passed between highly-polished metal rollers under great pressure. Some papers are also coated with a chalk-like surface to enhance the sharpness of the printing, as well as to make the removal of cancellations impossible. COLORS. The perception of color is a complex neurophysiological process. The visual perception of colors is associated with the various wavelengths in the visual portion of the electromagnetic spectrum. However the human eye does not function as a spectrograph. It can not separate colors into its components. The same color sensation can be produced by different physical stimuli. A mixture of red and green lights of the proper intensities appears to the eye as yellow, even though it does not contain light of the wavelength corresponding to yellow. Another complicating factor is that the human brain compensates. If we have a picnic on a sunny day on a meadow under a tree, the faces of the persons there will look perfectly normal, but if a color photograph is made of the scene, the faces look green. This is caused by the reflected light from the grass and the tree. Photographers are well aware of this and adjust for it by using the appropriate filters. Another curious phenomenon is the effect of temperature. We all may have observed that for example a certain billboard that we pass every day seems to have a slightly different color in winter than it has in summer. The colors of stamps are always seen by reflected light. These colors are caused by the partial absorption of white light. The pigments that give color to an object absorb certain wavelengths, producing thereby the color sensation of the unabsorbed light. The light source is of importance. A stamp will appear to have different shades of color in daylight, incandescent light or fluorescent light. Some modern highways, mostly in Europe, are lighted by sodium-vapor lamps, which emit a fully-saturated spectral yellow. It greatly enhances visibility, but plays havoc with colors. Blue and red cars look black, yellow cars look white and women are not pleased that their lipsticks look black. Many pigments, when illuminated by light of one hue, absorb this light and re-radiate light of a different hue, always of a longer wavelength. This phenomenon is called fluorescence, and is of importance in expertizing. The most effective light source for this purpose is short wave ultraviolet light. DESIGNS. The design, the printed image, is of crucial importance in expertizing and has been the subject of many studies and publications, showing the differences in design between the genuine stamps and the forgeries. This is of great importance in expertizing because it will instantly weed out most forgeries. But there is one caveat! A correct design does not guarantee genuineness, as one gentleman discovered to his embarrassment. In 1943 Jean de Sperati was charged with violation of the prevailing laws that prohibited the export of valuables from France. At his trial, Sperati’s defense was that the stamps he had shipped to Spain were not genuine and valuable, but were in fact his own reproductions and without value. The court appointed “expert”, Dr. Edmond Locard, a physician, was to examine the stamps. His findings, dated January 4, 1944, make for interesting reading. Dr. Locard, after using a whole paragraph to sum up his qualifications, describes at length how he carefully measured details and dimensions of the designs and correctness of the secret marks. His report concludes with his final authoritative statement that all eighteen stamps are genuine. It was certainly unfortunate for him that he did not know how to distinguish one printing process from another. The Sperati reproductions are lithographed, the genuine stamps are typographed. Sperati then produced a dozen copies of one of the stamps in question. All had the same identical postmark in the same identical position, a phenomenon so unnatural as to be instantly convincing. PRINTING PROCESSES. Virtually all stamps show a printed image. A few do not, such as the Natal first issue which is embossed only. There are three basic printing methods: engraving, typography and lithography. Most stamps are printed using one or a combination of these methods. Again, here too are exceptions. Some Cape of Good Hope Mafeking issues were made using the old blueprint machine, early Uganda issues were made on a typewriter, the Kume Shima provisional of the Ryukyu Islands was mimeographed. Modern refinements such as photogravure, halftone and offset are variations of these three printing processes. Engraved stamps show the ink lines slightly raised above the surface of the stamp and show corresponding depressions on the back. The degree of this depends on the relative depth of the engraved lines and on the ink and the paper used. Typography, the exact reverse of engraving, shows a slight raising of the lines on the back. More important for our purpose is the fact that the pressure of the typographic printing plate causes the ink to be squeezed toward the edges of the printed surfaces. This is visible as a fine frameline around the printed parts when one looks through the stamp under high magnification. The degree of this “framelining” depends on the pressure applied during printing and on the viscosity of the ink, and is a typical characteristic of each issue. Lithography produces a flat print, having none of the characteristics of engraved or typographed stamps. It has instead often the so-called lithographic flaws caused by the process of transferring the design to the plate. Engraved plates are usually made by a relief transfer roller rocking the design into the plate, one at the time. Each impression is therefore identical. Some plates were engraved one stamp at the time, with the result that each design is slightly different, such as the Dragons and Cherry Blossoms of Japan. Typographed plates are usually assembled from identical slugs or cliches, therefore each design is identical. Some plates were typeset from movable type, and thus each design is different, such as the Hawaiian numerals. PRINTING INKS. Printing inks are similar to paints, in that they consist of finely ground pigments dispersed in oil. The choice of printing ink is determined by the printing technique being used, the speed with which the printing must be done and the paper being used. The simplest form of black printing ink is made of carbon black in varnish or boiled linseed oil, generally with a drier added to reduce drying time. More complex printing methods require inks sometimes containing as many as fifteen ingredients. These include additions that affect appearance and durability, as well as synthetic oils that have the advantage of drying faster than natural oils. Generally inks used for engraving have a high viscosity, for typography somewhat less, and still less for lithography. Colored inks are made with both natural and chemically produced pigments and almost any color can be produced using a number of different pigments. This is of importance in expertizing because the different pigments usually fluoresce differently under ultraviolet light. The amusing forgery of the red Berlin overprints illustrates this.